Other than having a nut allergy, pistachios are a healthy snack. Easy to carry in your purse, backpack or gym bag and they require no refrigeration. Not to mention they are delicious! What could be easier for an on the go quick snack? Heading to lunch and need a little something to keep you from bad food decisions. 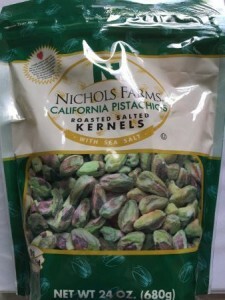 Pistachios! You’re craving a salty bag of chips or even a sweet, but you are trying to diet. Pistachios! Maybe you just want a flavorful crunch to add to your homemade trail-mix. Pistachios! Pistachios are such a wonderful option for any occasion. They not only taste great, but also have so many health benefits. I want to share with you why this nut is one of my favorites. Why should you add pistachios to your diet? They have unsaturated fats, such as omega-3 and as omega-6 essential fatty acids. Pistachios have 3 grams of fiber, 6 grams of protein and 11 grams of the “good” heart healthy fat per serving. This nut contains a lot of vitamins, minerals, phytochemicals copper, manganese, phosphorus, magnesium, iron, zinc, potassium, thiamine, B vitamins, E vitamins, calcium, oleic acid, and other strong antioxidants such as carotenes. They contain selenium, which reduces damaging tissue free radicals. Pistachios reduce bad cholesterol while they increase the good cholesterol. This yummy snack boosts your metabolism and increases energy production. Pistachios are complete, meaning they have all of the amino acids you need. Just remember . 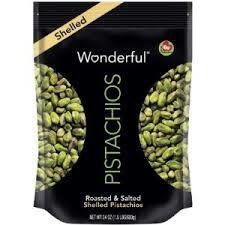 . . One serving of pistachios is 49 kernels and not an entire bag!